Searching for tools, parts, and supplies really saps the fun out of a project. That goes double for basic and rote tasks, like applying heat-shrink tubing while soldering cables. 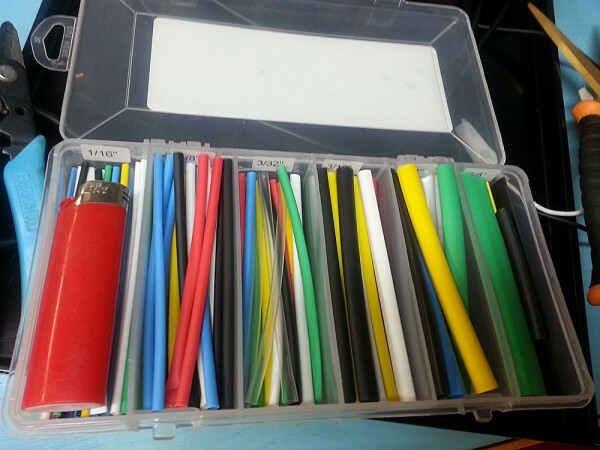 Recognizing this, I bought a ten-pack of Bic lighters and put one in every heat shrink assortment I have. I also dropped one next to my soldering iron. That way, even if my heat gun is misplaced, I will not have to search, wait, or think at all before I can finish the wiring – which is usually the least interesting part of any job. I do this with scissors, every room of the house. plastic syringes of machine oil.. in sewing and knitting machine cases.